In the next weeks we will try to keep you updated on the process of recovering a flooded collection (part of the collection). On Friday we were pouring water out of bags meant to protect a range of items from bowling shoes, stuffed birds, old trophies, boxes full of photos and post cards, whilst keeping hold of the paper labels tied to the objects. On the photo you can see one of the surreal mini scenarios we found – a collection of rare birds eggs floating in their drawer. My name is Marianne and I am on work experience from the Barclay School in Stevenage, I decided to choose the museum because I am very interested in history and particularly love learning about historical events but mainly historical people i.e Queen Victoria, the Tudors, Marie Antoinette etc. Today Mrs Maine came in and shared some of her Grandfather’s memorabilia from WW1, his old passport and a photograph of him and his comrades in East Suffolk hospital Christmas 1915. Fredrick Rowe joined the army during WW1 on Sunday May 30th 1915. He was 34 years old. It wasn’t until December 1915 that a month after the injury, Fredrick decided he will not return to they army, possibly because of his age and his injury. This was Fredrick’s last diary entrance for his time in the war. He was awarded four regular WW1 medals. 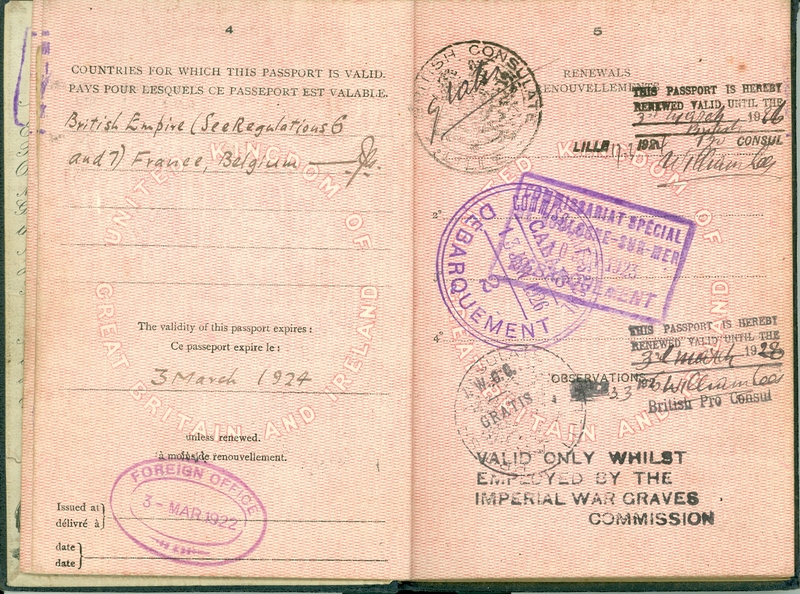 For a while Fredrick became a bank messenger before going to France to join the Imperial War Graves Commission in France. Although Fredrick was not an actual soldier during WW1 he saw plenty of bombing, enemy planes, fighting, death etc. It was proposed by Mr. Ellis, seconded by Mr. Day. 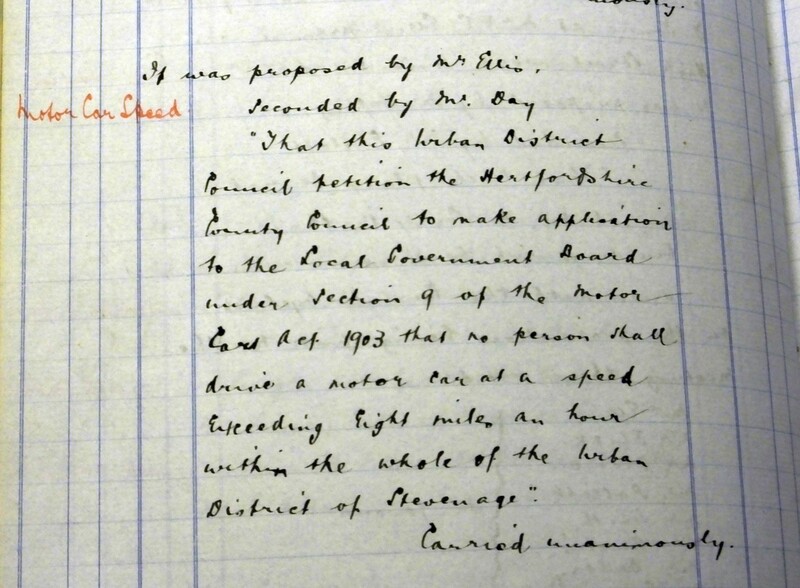 That this Urban District Council petition the Hertfordshire County Council to make application to the Local Government Board under Section 9 of the Motor Cars Act 1903 that no person shall drive a motor car at a speed exceeding eight miles an hour within the whole of the Urban District of Stevenage. People get in touch every week with enquiries about all sorts of things. 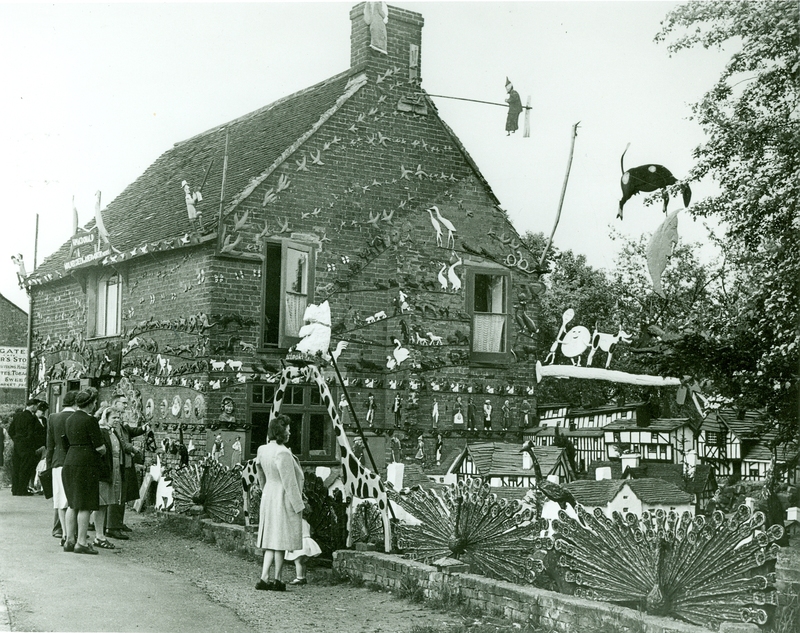 One gentleman recently wrote asking for photographs of the Woodcarver’s cottage he had seen as a boy, to illustrate an article he was writing to share with his family and his cycling club. He kindly agreed to share what he had written with us. We really enjoyed reading it and hope you do to. “The date 5th June 1942 represents the start of a whole new life for me. This was the date on which I received my first bicycle. Of course, it was not new – there was a world war raging, and all means of production were under government control with a view to winning the war. I had to make do with a collection of refurbished bits and pieces on a frame with no name, steel rims and wartime tyres of poor quality. Nonetheless it was mine – I no longer had to borrow other people’s bikes, and I could go outside the town without the guardianship of my elder sister, always going only where she wanted to go. One of the favourite destinations of my school friends was the Royal Air Force (RAF) airfield at Hunsdon, where we could see the aircraft returning from daylight raids over France, and dream of the day when could join them beating up the Huns. Not the finest ambition for 14 year olds, but that was life then. Another destination was Hatfield, where we could see the streamlined A4 pacific locomotion at the speed on the East Coast main line. This was another new experience for me. Although, as we lived near Kings Cross station I had seen many of those locomotives, I had only seen them gently backing into the platforms to join their trains and then starting up with clouds of steam and smoke and plenty of noise. At speed they were even more magnificent. 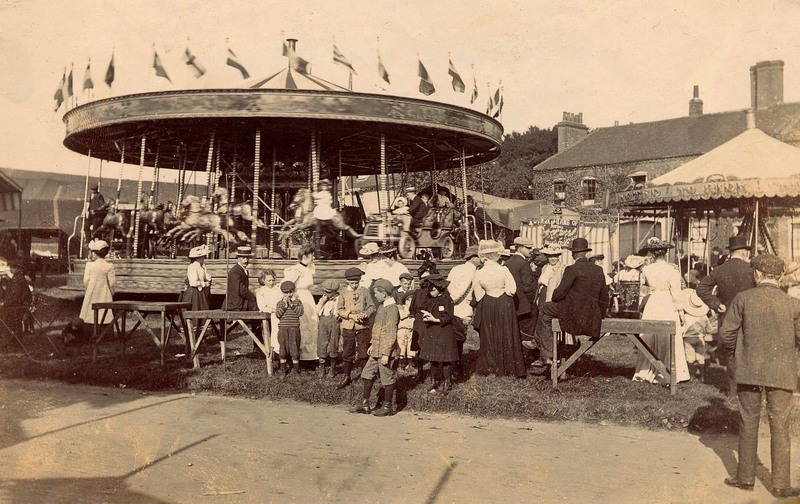 But I was not interested in cycling merely as means of transport – I enjoyed exploring the countryside, and this was particularly interesting in wartime. With the very real threat of invasion in 1940 all signposts, milestones and other means of indicating where one was and how to get anywhere were removed to Council yards. Maps could not be bought and none were printed (shortage of paper) and all public maps were hidden so that any parachutists would not know where they were – and neither could schoolboy cyclists! Finding one’s way there was one thing. Finding the way home another. An inhabitant of Newgatestreet refused to tell me where various roads out of the village led to. When I said Hertford he pointed to the road and said “that’s the way back to Hertford” and so I deliberately took the road I thought led to Cheshunt – and I was right. 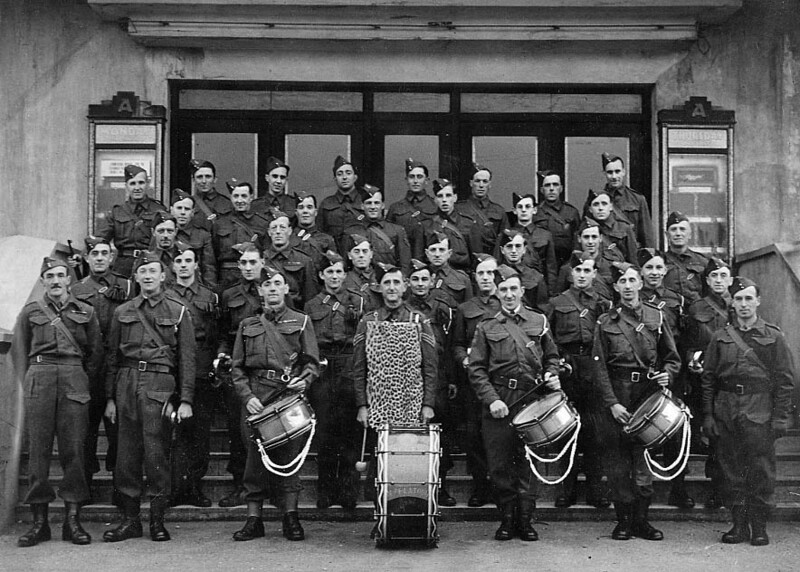 And so in 1943 – aged 14 – I set about finding my way around east Hertfordshire. I knew which road led from Hertford westwards to Hatfield and I knew which road led northwards to Stevenage and Hitchin. And so I worked out that the road out of Hertford to Bramfield should lead to the Great North Road somewhere between Hatfield and Stevenage. I was correct, of course and emerged at Woolmer Green – not that I knew it – but the road looked like the Great North Road and I duly turned left and so to Hatfield – eventually. But this was not before I stood absolutely astonished at a sight I had never seen before and the like of which I have not really seen since. This was a cottage, and the thing I recall most clearly was that the garden gates were carved of wood and painted like a peacocks displaying their marvellous feathers. The building was covered with carved and painted animals and birds, and we had the faces of Winston Churchill and Franklin D Roosevelt the U.S. President, looking down on us. Inside the garden were carvings of all sorts of animals – too many to count and remember. The whole thing was an absolute riot of fantasy and colour, and I had to stand and stare for some minutes at the whole colourful display – a complete contrast to the rainy afternoon around me. I could hardly believe my eyes , and I still find it difficult to find describe my feelings. It was like something out of Walt Disney except that I doubt he ever had anything like this. I had no idea what the place was and when I spoke to people in Ware, where I was l was living and Hertford where I was at school, nobody had any idea of what I was talking about. Remember, if a bus did not go from your town or village to a particular place then you simply did not get there unless you walked or cycled, which few people did. Cars were an expensive luxury for the few in the 1930s and during the war petrol was rationed, so if you did not qualify for a petrol ration you laid your car up for the duration – it was as simple as that. And so it was a good time for cycling – even better than before the war as regards traffic. Mr MacDonald’s cottage. How many different carvings can you see? Double click on the image for a bigger picture. 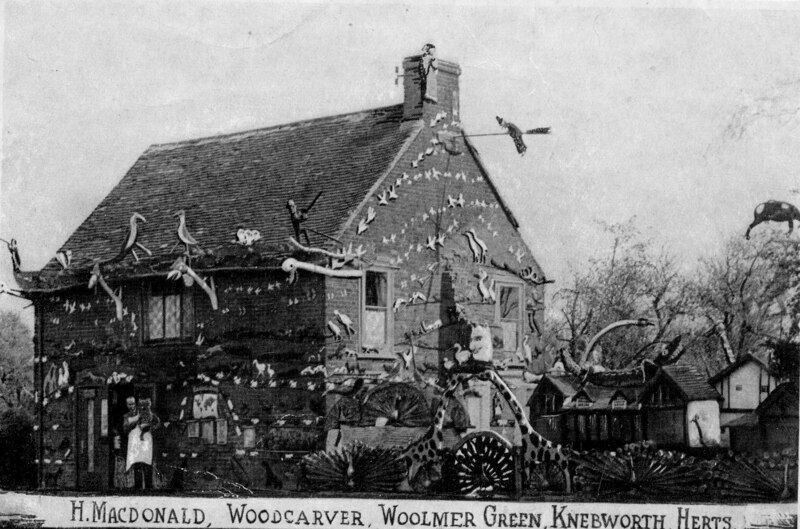 I have never forgotten about the woodcarver’s cottage but by the time I got around owning a car and taking my children there in the late 1960s it was a shadow of what it had been. I think the woodcarver had retired or died and his son was running the garden as an attraction for visitors on payment of a few coppers – tourism had hardly been invented then. Although it was interesting (and the children enjoyed it) to have animals popping up when you trod on some sort of levered plate set in into the path, the general air was of neglect and I was disappointed. 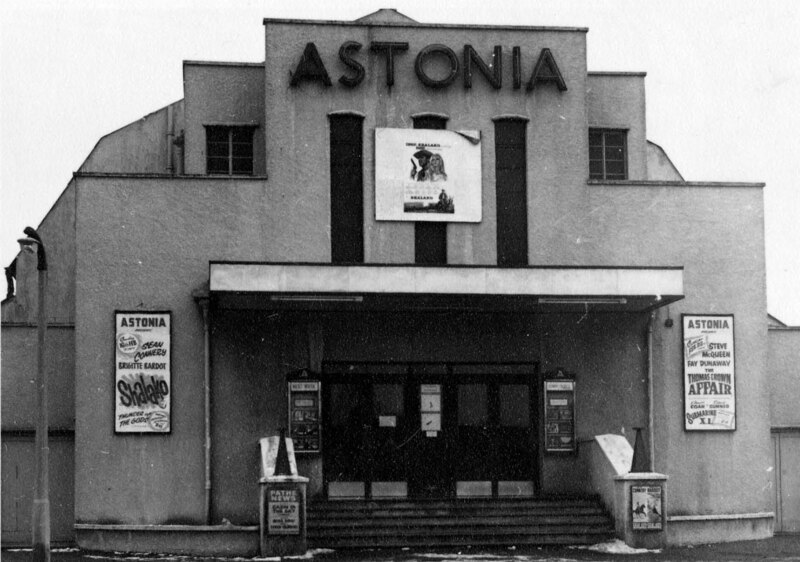 I recall that there was a local protest later when it was proposed to demolish the place and to build on the site, but this did not last. I imagine nobody wanted to smarten the whole lot up and run it, and so it all disappeared and new buildings were constructed. However, my interest was rekindled when I bought a picture book of Stevenage some year ago, and to my intense pleasure this included a picture of the cottage and the woodcarver. Apparently the owner was a joiner who, when business was slack, spent his time designing and creating the carvings to advertise his business and displaying them for a few coppers to augment his earnings. From my point of view, this is the sort of item I look out for on a ride, especially if I am describing the ride for others. What could be a better incentive to get children out on their bikes, or to keep them going a bit further (without protest) than to have something like the Woodcarvers Cottage to entice them on? 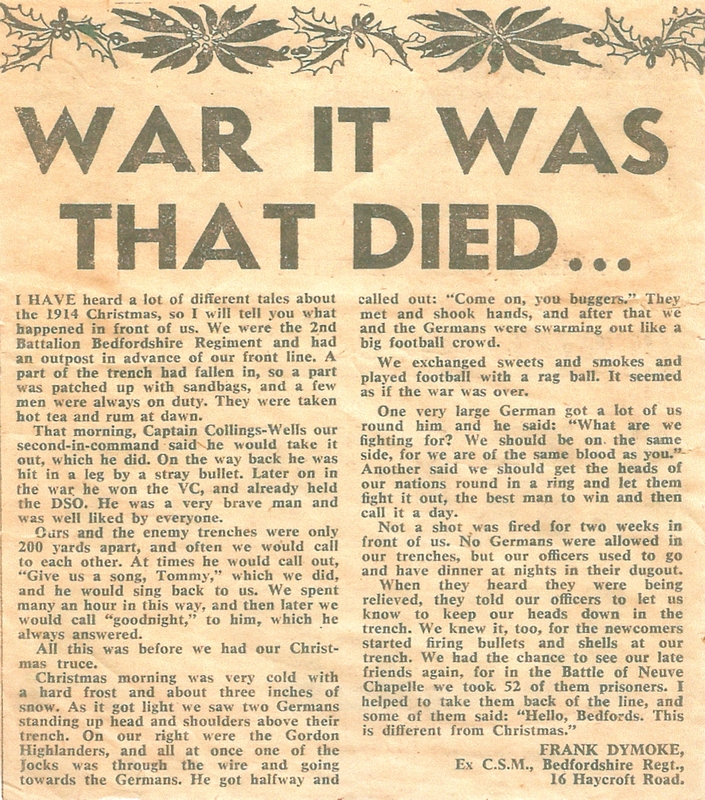 I’ve heard a lot about the Christmas Truce but until last week I didn’t know that local Stevenage men were there. Frank Dymoke shared his memories with The Comet newspaper in December 1971. Last week a member of his family kindly brought a copy in to the museum and told us a bit more about the man behind the story. 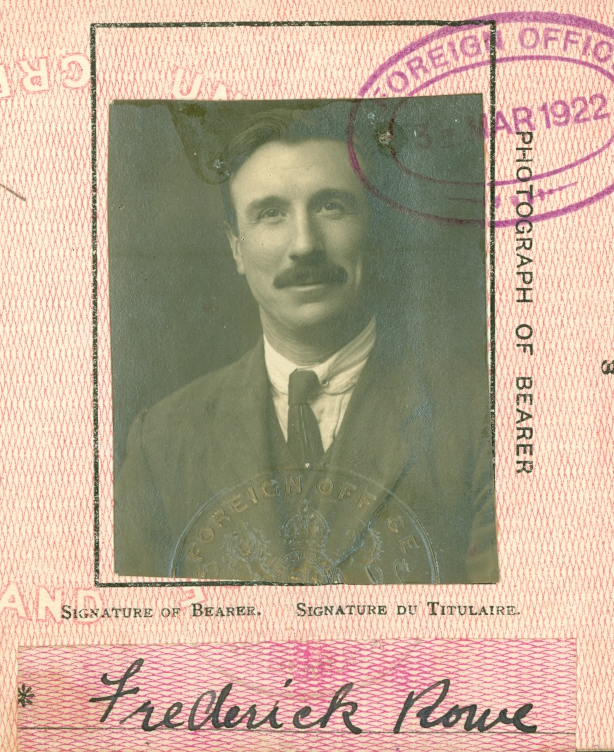 Frank enlisted in the Bedfordshire regiment in October 1911. He served for the whole war, finishing in January 1919 as a company sergeant major. Before he joined up he had been a groom for a family at Chesfield and when the war started his old employers sent him a pair of duelling pistols along with the request that he kill a few Germans for them! Unfortunately the pistols were stolen when he was injured. He suffered three injuries and had fever four times but survived the war and came home. 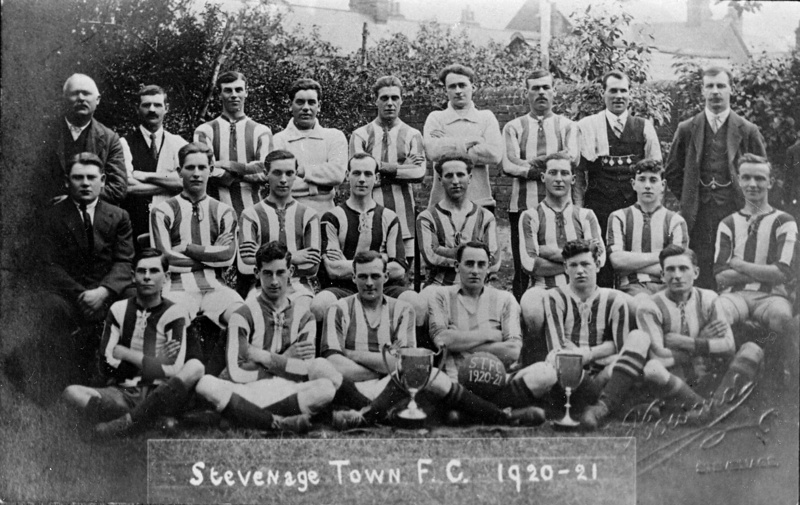 He played for Stevenage Town Football Club and in this team photograph you can see him in the back row, third from the right. Christmas morning was very cold with a hard frost and about three inches of snow. As it got light we saw two Germans standing up head and shoulders above their trench. On our right were the Gordon Highlanders, and all at once one of the jocks was through the wire and going towards the Germans. He got halfway and called out: “Come on, you buggers.” They met and shook hands, and after that we and the Germans were swarming out like a big football crowd. We exchanged sweets and smokes and played football with a rag ball. It seemed as if the war was over. One very large German got a lot of us round him and he said: “What are we fighting for? We should be on the same side, for we are of the same blood as you.” Another said we should get the heads of our nations round in a ring and let them fight it out, the best man to win and call it a day. Not a shot was fired for two weeks. No Germans were allowed in our trenches but our officers used to go and have dinner in their dugout. Visitors to Stevenage Museum may have noticed that we have a large stuffed animal (taxidermy) collection in our Natural History gallery. 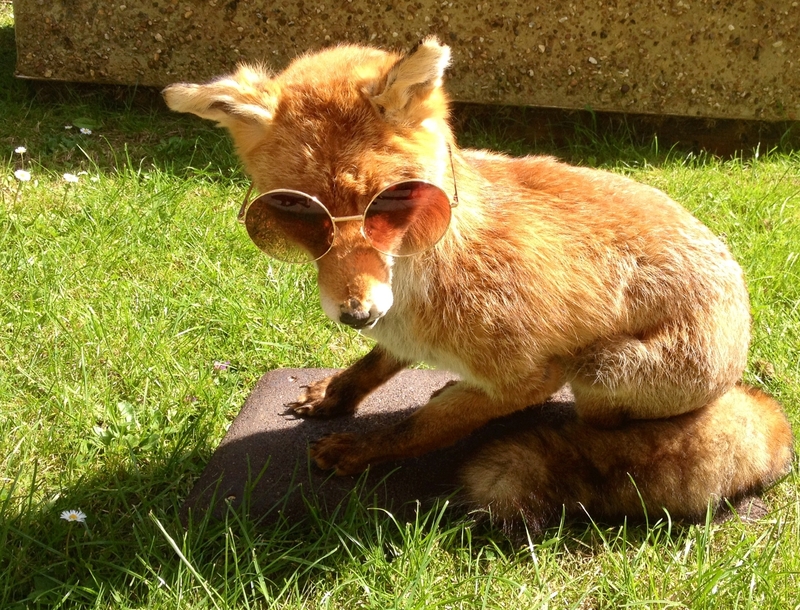 Taxidermy is the art of preparing, stuffing and mounting animal skins and has been practised for many years by taxidermists, the earliest examples having been recorded in the Middle Ages. It is a method of preservation and has been used mostly by hunters to show off their most impressive kills and natural historians so that they can study increasingly rare species. 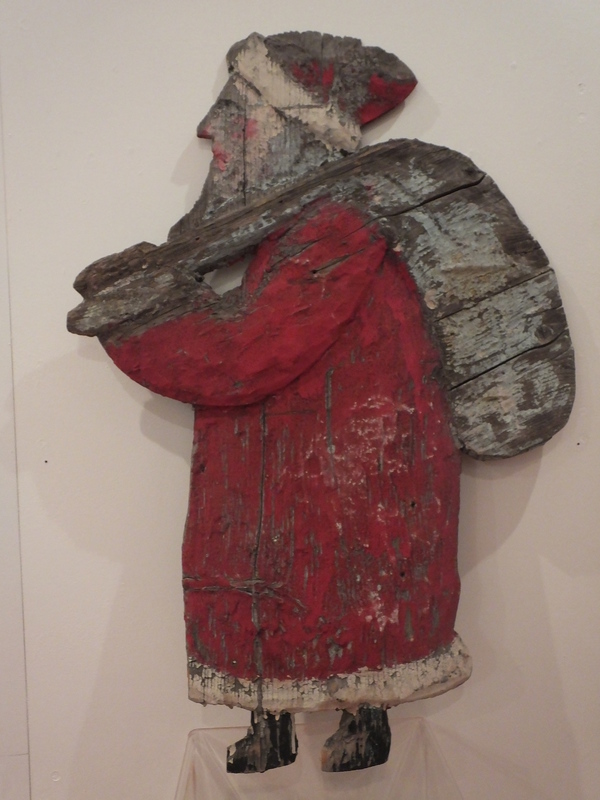 It was also popular in the Victorian times, as people thought they were a stylish decoration in their homes. Though it is less common to see taxidermy on a household level now, some pet owners will have their beloved cats and dogs treated in this way as an homage to their existence! Mr Fox is a figure I remember from when I was a child, visiting Stevenage Museum with my mother and sister in the 1990s and early 2000s. Though my sister and I found the gallery a little scary at first, we were delighted by the small furry animals and loved the fact that we could stroke the top of Mr Fox’s head. We weren’t the only ones either, poor Mr Fox has had a number of operations over the years to patch up small injuries after visitors played a little too roughly with him! Richard Carpenter’s dolls’ house is one of our star items; its delightfully miniature nature draws a great deal of attention as it slowly revolves, allowing you to see it from all angles. Richard Carpenter was born in Stevenage in 1890 and in 1903 he began work at the Educational Supply Association (ESA) as an apprentice joiner, cabinet maker and polisher. 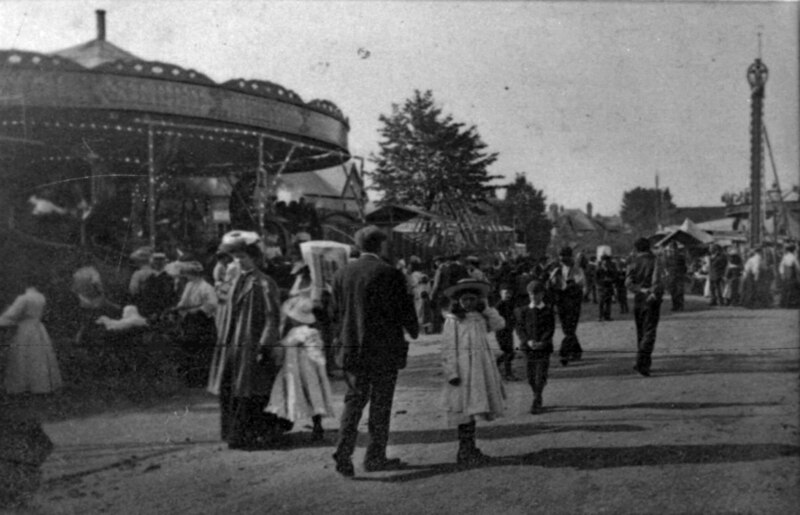 Trading began here in 1883 on Fishers Green Road and was the first factory in the town, offering an alternative to the otherwise largely agricultural work available. 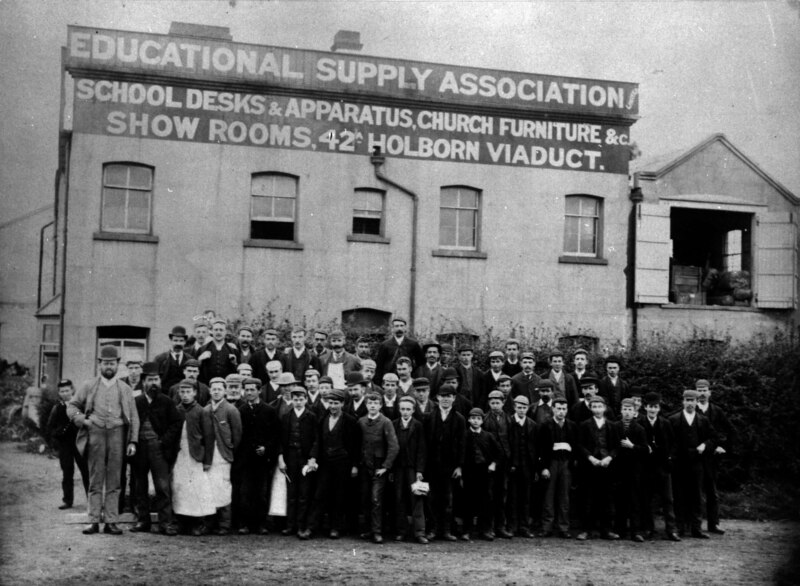 The ESA was known for providing low cost but good quality furniture and was the leading supplier for folding classroom partitions. The dolls’ house itself is based on a housing design by Mr. Leonard who worked in the drawing office at the ESA with Mr. Carpenter. His design for a school table and chair became a symbol of the post-war classroom. His innovative designs spread wider to homes and housing projects, but can be seen very clearly in the image of this modern and practical furniture design. It was Mr. Carpenter’s daughter, Yvonne, who inspired the building of this delightful house; its execution was so perfect however that it never became a plaything. The dolls house took nine years to complete, including building and furnishings, by which time his daughter had grown to be thirteen years old. The dolls’ house illustrates the design principles that inspired Mr Leonard throughout his career. You can see the simple shapes, clean lines and minimal surface decoration in both the house and its furnishings.